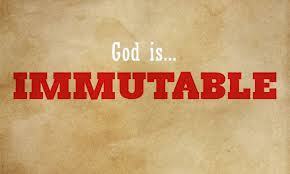 God is changeless…. He is constant and steadfast. In the Bible, Jesus is unchanging. In the cults, Jesus changes. Jehovah’s Witnesses – Jesus is Michael the archangel who became a man and became Michael the archangel again. Mormonism – Jesus is seen as a spirit-begotten creature in the pre-existence that became a man and then became a God. Jesus was with the saints of old, as is shown in the Old Testament. Jesus will be with you in the future. To be with you always, means always… forever. In all of eternity, the Lord Jesus will be forever interceding for you. Never in all eternity will you have to worry about God failing, about God changing His mind about you, or about being rejected in anyway. God cannot change. He cannot break a promise. He cannot stop loving you. He cannot cast you away. I am in day two of my 2nd cycle of my chemotherapy treatments today, and I can tell you that my body has gone through some radical changes since two days ago. With the beginning of every treatment, I have to go through what they call a 2 hour drip of a powerful chemotherapy solution given intravenously. In short, it is a high concentrate of the 8 pills I also have to take every day. Last months cycle, I had some side effects from this drip. They lingered for about 2-3 days. After that, my body appeared to acclimate to the daily pills routine. Last night, it was tough to get to sleep, and stay asleep due to nausea beginning around three a.m.. Why am I telling you all this? Hopefully that you will include me in your prayers, and be thankful to God that whatever and whenever we change, in our attitudes, in our promises towards each other, thank God that He never changes. Jesus is the center of my faith, and I must rely on His dependability to meet my every need. This means that whenever I’m sick, not doing well, my perspective may change at least momentarily, but God’s eye toward me and purpose in this has not changed. He is lovingly accountable for me in this. Questions arise in my mind like: ‘Why doesn’t God just heal me?” While I desire to see immediate changes in and around my life, I am not looking at the big picture, I find myself dragging my feet in the present, and that keeps me from trusting God in something I’m just to busy waddling in the present. he Bible does teaches us that, past, present and future: ‘all things are working together for good” and this includes the things I don’t like when I just want to change right now! Especially in taking these medicines for the treatments. Change is good and sometimes necessary. But, though we may change, though circumstances may change, Jesus does not change. He is always there for us, always dependable, always concerned for and about us. It means you can always count on Jesus being there in this life….even when it doesn’t seem like He is. He doesn’t change. It means you can always depend upon His Character to never change. It means that His love for you cannot ever decrease. It means that He is committed to you, in all times, in all things. 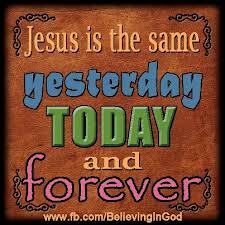 Though the circumstances change, people change, and yes, you change, Jesus never does change. You can always count on Jesus. Please take note that most of these devotional blogs do have at the end, a musical inspirational video attached. It has come to my attention that if you are a ‘Follower’ to this site and receive email updates, you may be missing this part. If you can help me resolve this problem, please email me at Isaiah43@juno.com. Prev Giant Problems? No Problem! Thank you Marty for your honesty in this season of your life and your dependency on Jesus to get you through the ruff days. I am so thankful for His truth and His Word and how, as you said, He never ever changes. Yes. our emotions, feelings, circumstances, perceptions and well, us entirely will and do change every single day, but He is stable, constant, steadfast, secure and unchangeable. Oh how I wish and want to be more like Jesus! I love what you wrote here, “God cannot change. He cannot break a promise.” …the Lord gave me a verse a couple days ago that confirmed the same….”God is not a man, so He does not lie. He is not human, so He does not change his mind. Has He ever spoken and failed to act? Has He ever promised and not carried it through?” – Numbers 23:19. I love how His Word never changes and how His promises will come to pass one day. To rest in that and trust in Him completely seems so simple, yet is so difficult sometimes…when our eyes repeatedly deceive us and the enemy repeatedly lies to us. But, nevertheless, how God is good all the time and does fulfill every single one. Walking by faith may not always be the “easiest” road to walk down but I praise and thank God it does have a finish line, everlasting life and that it is neither walked down alone or in vain. =] God bless you! What a relief that our God is constant and always consistent! I am so proud of you for meeting this health challenge with such courage. I know it’s the Lord that is giving you the strength I see you display. Even in the midst of your illness, your eyes rarely stray from Jesus. I know the Lord is perfecting His perfect plan in you! Beautiful song!